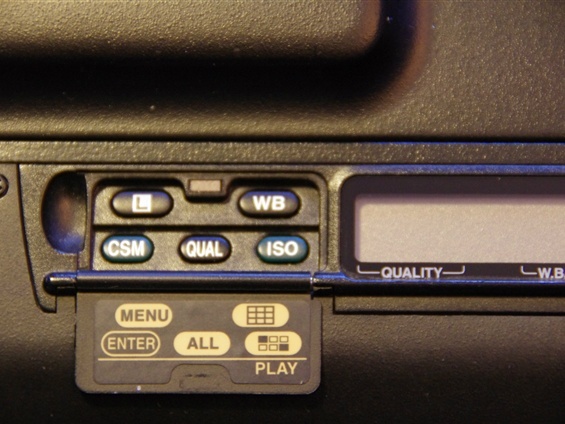 The 90s was going to give birth to the most imortant change in the history of the PP SLRs: The digital technique. Kodak was the frontrunner, but had to rely on existing camera houses, primarely Nikons, to wrap in their software. 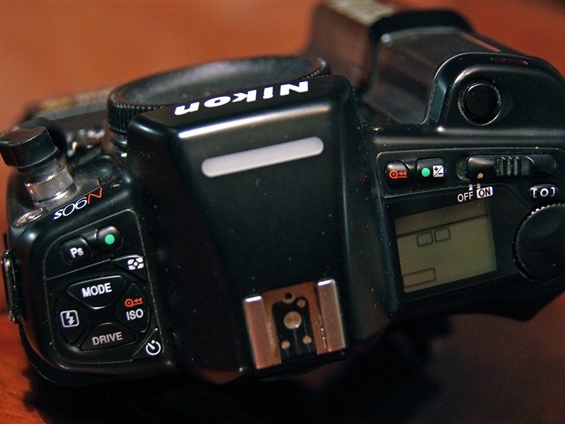 Nikon was the first camera producer to launch a comercial digital SLR, later to be called DSLR. DSLR was soon to be divided into two main categories, the professional full frame with 36x24 mm sensor format, and the half frame based on the film format 24x16 that was introduced in the 90s, but never really cought on. 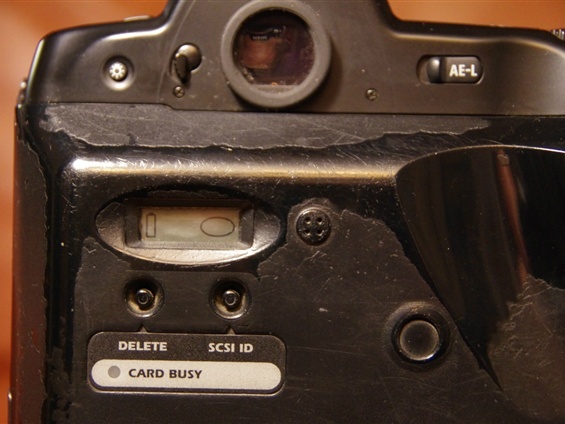 The system was called Advanced Photo System, consequently the half format DSLRs were called APS-C, the C meaning Classic. A third format is the Medium Format cameras based on the medium format film cameras, such as the Pentax 645. These cameras are purely professional and very highly priced. But the wast majority of the cameras sold in the 90s were still film cameras. 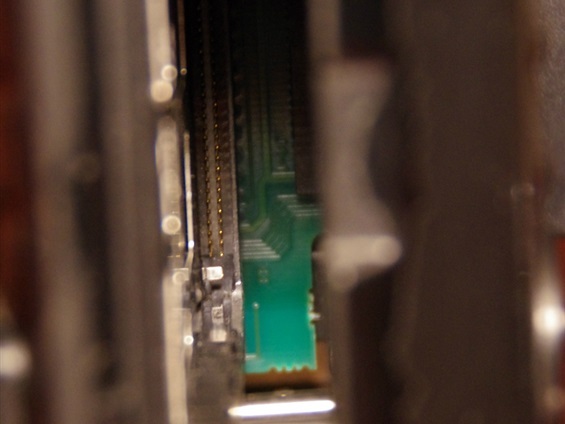 They were developed to picture machines with programs for this and programs for that. So many options that you could find a program and an AF mode for any situation. Funny to think of, though, that one will probably work faster in the manual mode, and with better results! If one knows how to. 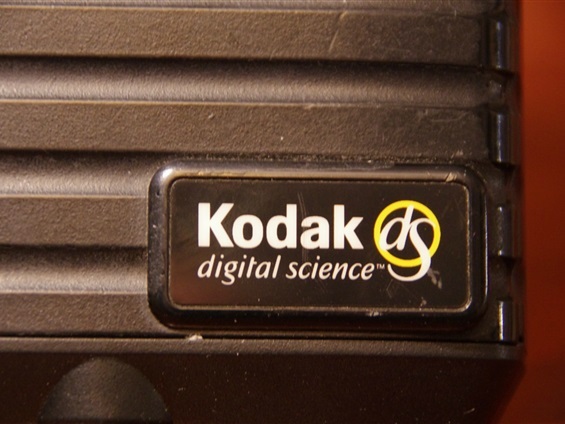 Since the first half of the 70s, Kodak had experimentet with digital cameras. 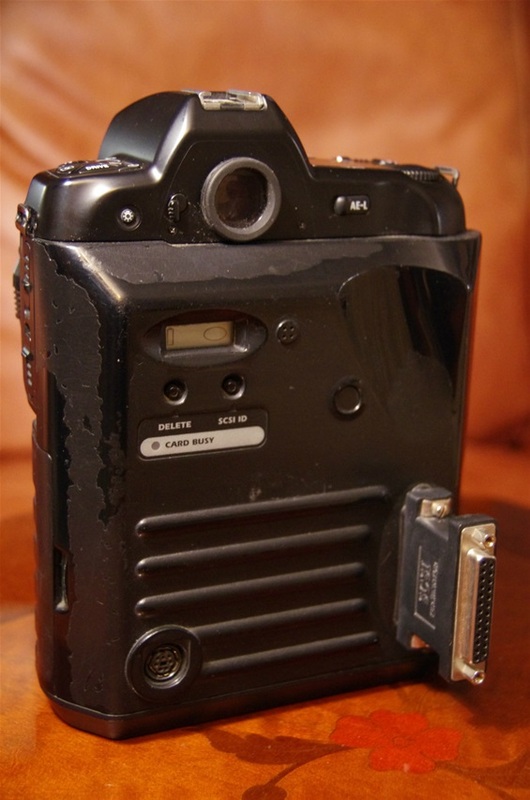 In 1991 they presented the worlds first DSLR, the DCS, later called DCS 100. But they had to choose an existing camera house, and they chose a Nikon F4. The resolution was not high and the image quality was far from reaching that of the film cameras. But the new world was announced, and through the 90s it was coming closer. Kodak DCS 420, built on a Nikon 90 house. 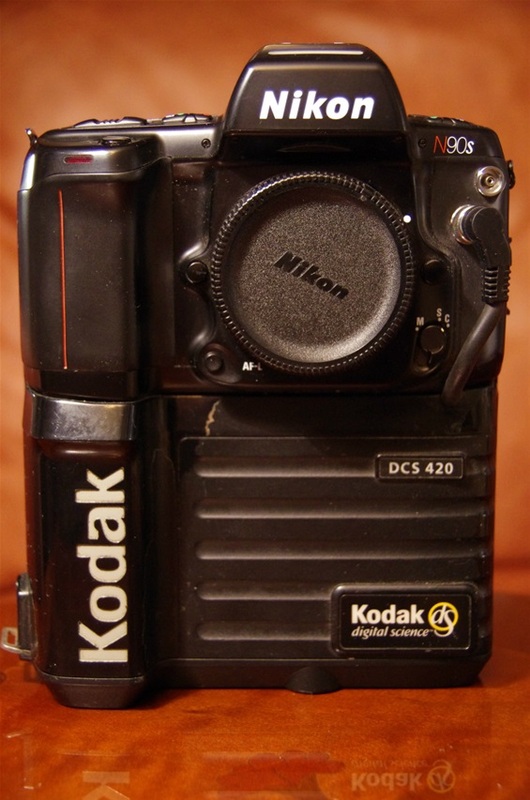 Introduced in 1994, the 400 was the third of the 7 Kodak series from 1991 till 2005, when Kodak stopped their digital camera production. This camera had a price tag of 28000$ when it was released! My sample has sn. 420-8818. Not exactly neat. Battery and memory card needed space. After Kodak had shown the world the digital way, Nikon was the first camera producer to launch a DSLR - Digital Single Lens Reflex. 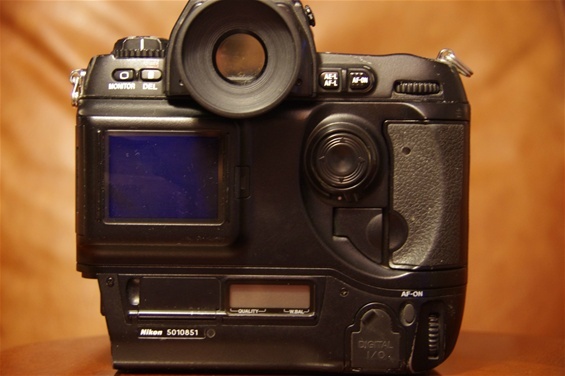 While Kodak introduced their first commercial camera, though in a Nikon house in 1991, Nikon introduced their first homemade full DSLR in 1999. When going through my collection, one will find that this is the only Nikon presented since the F! Not that Nikon was not making interesting cameras through that period. On the contrary, they were "the cameramans camera", always offering the best to the professionals. But they did not present many worlds firsts. 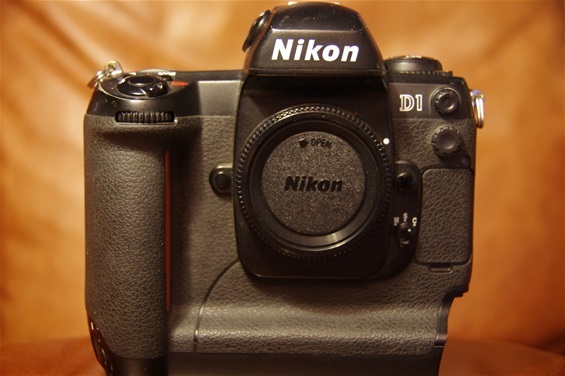 The first DSLR made solely by one producer, the Nikon D1. Nikon aimed directly at the pros, and impressed most of them with 2,7 megapixel.Not much compared to todays standards, but lot more than the Kodaks until then. And to less than half the price. 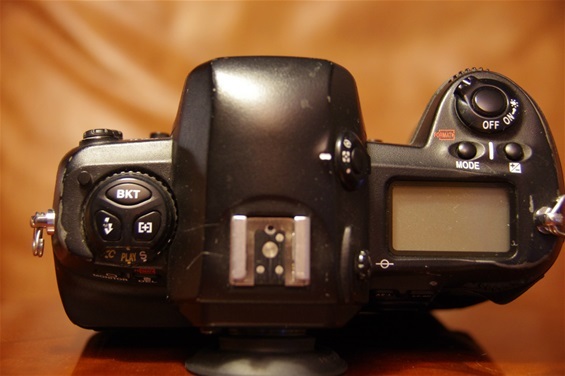 The end of the beginning of DSLRs and the beginning of the end to film, as one commentator stated. Size: 157x153x85.Weight without batteries: 1100gr. Sn: 5010851. Unless one catches the Pc and Play-mode on the left dial, there is not much to disclose the news from this angle..
but here it lies: most of what we know from todays cameras was presented with the D1. The D1 was followed up by the D1H and D1X.